Dr. Roy has achieved great success in his practice by combining Traditional Chiropractic Techniques with Trigger Point Therapy and Dry Needling Technique. 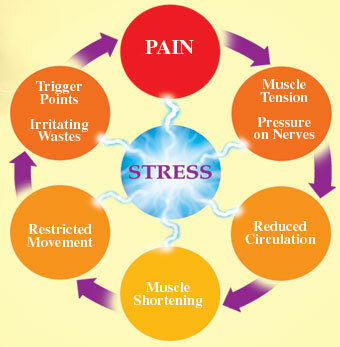 When pain is present, muscles always go into a degree of spasm. This is a protective mechanism. So muscle pain is often not the primary problem, but you still have to treat it to ensure a full and speedy recovery. Following injury to a muscle, a myofascial trigger point or Trigger Point (TP) may form. This is a small area within a muscle, which, after injury, can remain for many years (long after the original injury has healed), and may cause chronic pain and stiffness. A trigger point is not an area of scar tissue from an injury. It is an area of increased sensitivity in the muscle. When pressure is applied to this point, pain is usually felt at a distant area which is called referred pain. Trigger points can develop in any skeletal muscle. They are found in a specific area of the muscle and each muscle gives referred pain to a specific area. Dr. Stephane Roy is a Certified NeuroMuscular Therapist, NMT, and is also certified in Dry Needling. He has been diagnosing and treating trigger points with great success for many years. So, what causes a trigger point? - TPs may be secondary to some other pathology that may cause pain referred to a muscle. For example, a peptic ulcer may lead to TPs in the deep abdominal muscles, which may persist long after the ulcer has healed. TPs are known to refer pain to other muscles, and this can lead to the formation of a fresh TP in the second muscle; thus trigger point pain can spread progressively through the body, usually in a downward direction. There is an individual variation in the tendency to develop TPs: people of an anxious personality, whose muscles are already under chronic raised tension, and people who lead a sedentary life, are most likely to suffer. Several latent TPs may be present in a group of muscles, and this is called an "injury pool". This may remain latent for many years until an (apparently trivial) injury occurs, which rapidly activates all of them, giving rise to genuine and severe symptoms. We often see people having developed severe and persistent pain after seemingly trivial trauma. These people have often not been taken seriously by other physicians. But it is often explained by an activation of an "injury pool". Trigger Points have specific pain patterns as indicated in the picture above. You may recall an injury occurring just before the onset of pain (although frequently this will have been dismissed as too trivial), or you may identify one of the precipitating (or activating) factors described above. The pain arising from a TP may vary in severity, and there may be an underlying ache in the surrounding area (referred pain) or soreness in the muscle. The pain may be described as a burning or gripping pain, or a heavy, dull ache. TPs may cause entrapment of underlying nerves, giving rise to neurological symptoms, e.g. pins and needles in the hand. TPs frequently disrupt sleep as resting the muscle in a shortened position sets off the pain. Sufferers feel most comfortable when gently exercising the muscle. The diagnosis is suggested by the history and as part of the chiropractic examination. Dr. Roy will check for trigger points in the relevant muscles by using his hands and feeling for lumps and bumps in the musculature. They are easy to find when you know where to check and how to do it. When pressure is applied on the trigger point, it will often elicit tenderness and refer pain into a distant part. The area of referred pain will depend on which muscle is involved. A palpable band may be felt in the muscle and the most sensitive part of this is the TP. Tweaking it (like plucking a guitar string) may produce a twitching of the whole muscle. Dr. Roy will compare muscles on both sides of the body, as some people are normally tender; it is abnormal tenderness that indicates a TP. Trigger Points can be treated by hand by applying pressure (NeuroMuscular Therapy AKA Trigger Point Therapy) or by inserting an acupuncture needle directly into the Trigger Point (Dry Needling). Dr. Roy will determine which method to use depending on your case and preferences. Dr. Roy will also teach you methods that can be used at home to aid you in your healing. It is extremely rare for anybody to have trigger points in a muscle without any underlying joint problems relating to the spine, so the number of treatments needed depends on your condition. However, the number of treatments needed to deal with the trigger points are usually less than the overall course of treatment. But for more chronic problems it is necessary to do trigger point work for a longer period of time. In acute cases of myofascial trigger point pain, TPs can be readily deactivated in one to three treatments. TPs seem to become more resistant after about 6 months, and chronic TPs usually need prolonged therapy and exercises, alongside your chiropractic care. The frequency of visits is determined by your problem and how quickly you respond to the chiropractic treatment program. In some acute cases it may be necessary to repeat treatment quickly so that each treatment builds on the effect of the last.